The Harig Products Division of Bridgeport Machines, Inc., headquartered in Elgin, Illinois, designs and manufactures a line of manual, automatic and CNC surface grinders. 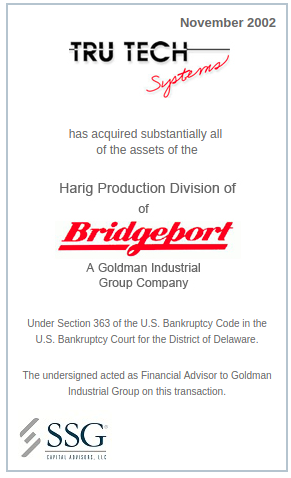 The recession in the manufacturing economy in 2001 and 2002 and the related dramatic deterioration in the demand for capital equipment resulted in a substantial decline in sales of both Harig and its parent company, Bridgeport. As a result, Bridgeport filed for protection under Chapter 11 of the U.S. Bankruptcy Code in February 2002. SSG was retained in March 2002 to sell Bridgeport and Harig together or separately in order to maximize the value to the Bankruptcy Estate. After the purchaser of Bridgeport excluded Harig from its transaction, SSG quickly went to market to sell Harig on a stand-alone basis. A Section 363 auction was held in November 2002. Tru Tech Systems, Inc. was deemed the highest and best bidder. The transaction closed in November 2002.